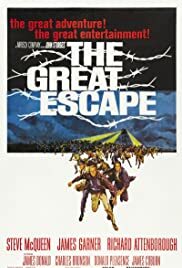 Q: What is 'The Great Escape' about? Credit should be given to the brilliant score by Elmer Bernstein. If you listen to it closely, it literally is a battle between the Allied Prisoners (flutes & woodwinds) and the Germans (tubas). The escape scenes with the little boat on the scenic german river is evocative of Wagner and his heroic Germanic Operas. The scenery of the German countryside and the Alps is breathtaking. 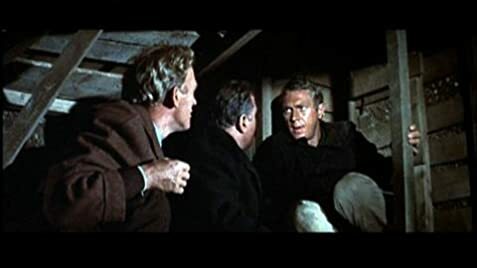 I believe that the scriptwriters emphasized the heroism, humor, and character of the prisoners to make an uplifting statement of what is essentially a cruel and tragic story. As a child growing up in the seventies, our 7th grade glass was reading the Paul Brickhill book and we had the opportunity to meet a former (American) Stalag Luft III prisoner from that era. He had arrived at the camp after the Great Escape, but was placed on the monument detail for the 50 executed men. He said that few men seriously contemplated escape after this incident and the emphasis was on surviving the war and going home alive. 49 of 68 people found this review helpful. Was this review helpful to you?